Jasper Johns is an American contemporary artist, known for his works in painting and printmaking. Born in Augusta, Georgia, he moved to Allendale, South Carolina with his grandparents where he spent his younger life there. He graduated high school in Sumter, South Carolina. Johns studied at the University of South Carolina from 1947 to 1948. He then moved to New York City and studied briefly at the Parsons School of Design in 1949. Upon his return to New York in 1954, Johns met artist Robert Rauchenberg and began working together to explore the world of contemporary art. In 1958, gallery owner Leo Castelli met Johns while visiting Rauchenberg’s studio and offered Johns a showing for his art. Alfred Barr, the founder of New York's Museum of Modern Art, purchased four works from his exhibition. Johns is best known for his painting “Flag”, which he painted after having a dream of the American flag. He was also famous for his works; “Study for Skin”, “False Start”, and “Crosshatch” which he painted later. His work is often described as a Neo-Dadaist, even though his work is based on images and objects from popular culture relating to pop art. His early work was based on figures such as maps, flags, numbers, and letters. Neo-Dada work focuses less on the abstract artistic skill and expression, and more on simple expression that is straightforward and to the point that displays a clear message to the viewer through simple figures. Johns was also involved in printmaking and sculpture. His beginning works with sculptures starts with wax, forming a basic figure, then carving complex textures into the wax and layering impressions of objects, he then proceeds to cast the mold in bronze, and finishing the cast sculpture with a layer of patina. Johns was involved in printmaking since 1960 with Universal Limited Art Editions, Inc, studying earlier compositions and working to develop the field of printmaking. In 1971, Johns became the first artist at ULAE to use the handfed offset lithographic press. Later he focused his efforts on lithography at Gemini G.E.L. In 1976, Johns partnered with writer Samuel Beckett to create the book “Fizzles”; the book includes 33 etchings of Johns’ work. 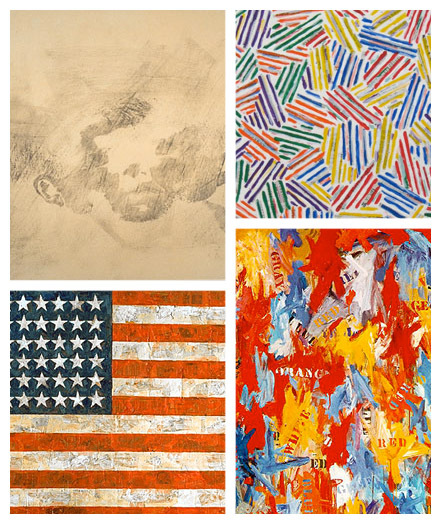 Jasper Johns is still alive to this date at the age of 83, currently living in New York. He is arguably one of the most influential artists in the artistic world.